Baking, to this beginner, has always been the equivalent of the big white space on old maps of China–nev er been there, never going. 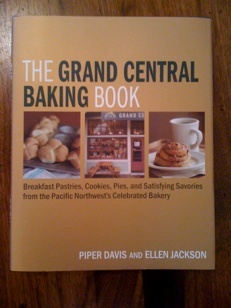 But because my friend Gwen Bassetti was the founder of the Grand Central Bakery, I decided (as much out of loyalty as anything else) to get her daughter Piper’s cookbook. It’s terrific!–Well-laid-out recipes that are easy to follow, beautiful photos, and head-notes with personal and family memories that give you the feeling that an old friend has dropped by to get you going. Did I mention the extensive, well-illustrated how-to sections? A must-have!